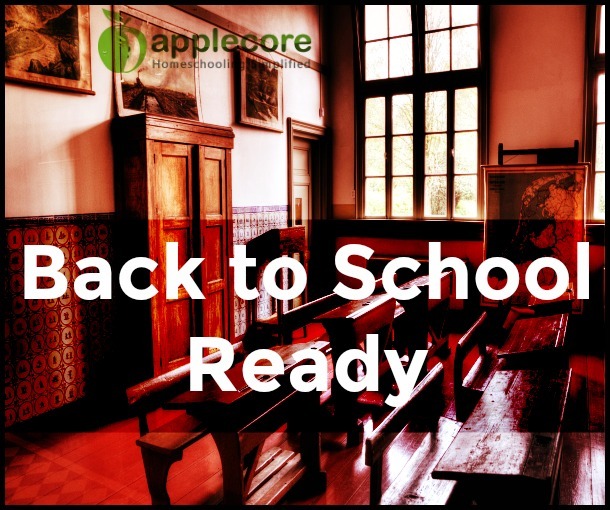 Home » Homeschool Helps » Back to School Ready? It’s back-to-school time! If you’re starting this week, next, or even next month here are a few tips to be back to school ready! Clean Space. Do yourself a huge favor and clean up your work space before you start work! If that’s a desk, table, bookshelf, or something else … get organized. Signed up for sports? Put a plastic bin in your trunk and throw all the equipment in there. Don’t start day one behind the clean up eight ball. Calendars. If you set alarms on your phone, google calendar, or print one – get your calendars ready. If it’s for the day, week, or month have them out and ready to roll! Print your lesson plans too! Looking for free ones? Check out our post: Free Lesson Plans. Fill the Pantry. Hungry children are a bummer, but an empty pantry is a complete kill joy. I even pull out snacks in the morning and put them in our EasyLunchBox coolers. My boys know when it’s “snack time”, so they just go to their color cooler and pull out one of the snacks. Some days I put out a fruit tray early and they can snack without stopping lessons to ask for food. Get Rest. If I sound like a broken record, good! Rest is so very important for a happy home. For moms, growing students, and every one involved – get a good night’s sleep. Do not start bedtimes the day before school starts. Get in the habit a few days before so there are no dragging unhappy faces the first day. Wondering about bedtimes? Read our post: Homeschool Bedtimes. Set Goals. In the beginning I was just happy to finish a homeschool year. But as we creep up on high school I realize we have so much more potential than to just army crawl our way across the finish line. Sit down with your children and ask what they hope to accomplish. What do they want to learn. Where do they want to field trip, etc. Within reason of course – try to incorporate some of their ideas into your homeschool. It will definitely give them something to look forward to this year. It will also help you to say NO to all those other things that pop up and steal your time.